If you’re planning a beach vacation, the Caribbean coastline is definitely one of the very best places to be. The Caribbean Sea is famous all around the world for its exceptionally warm waters, magical coral reefs, and unbeatably soft sands, but you don’t actually have to head out to an island to enjoy and experience all the beauty and warmth of the Caribbean Sea. 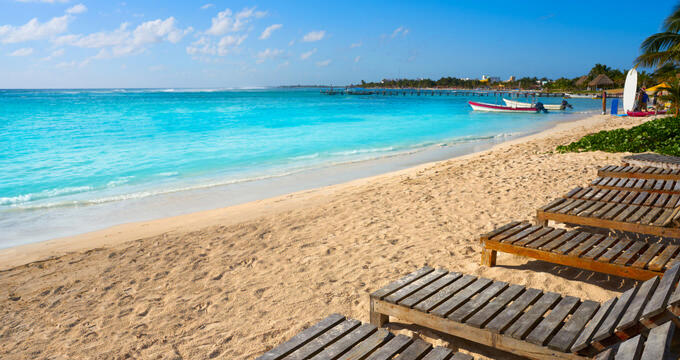 Many Central American countries and regions have coastlines on the Caribbean, and even Mexico has some gorgeous Caribbean beaches in its Costa Maya region. Situated in the Othon P. Blanco municipality of the Quintana Roo state, Costa Maya is one of the prettiest little coastal areas in all of Mexico and one of the nation's main Caribbean coast beach towns. The Costa Maya region was once a sleepy, untouched area, but growing tourism in Mexico and the Caribbean helped this place to grow and develop over time to become a popular cruise destination. Modern day Costa Maya is unrecognizable to how it seemed just a couple of decades ago, fitted out with many modern amenities and luxuries like restaurants, bars, attractions, and even a large shopping mall. Costa Maya is where you’ll find Mexico’s best beaches. The sands are softest and the waters are warmest in this part of the country, offering idyllic conditions for all kinds of seafront activities from snorkeling and surfing to sunbathing and picnics. People of all ages will be captivated by the beauty and charms of Costa Maya’s beaches, but there are a lot of locations to choose from in the region. So if you need a little help finding the best beaches in Costa Maya, read on to learn more. A tropical paradise, Mahahual Beach is one of the best and most popular beaches in the Costa Maya region. The local village was once a sleepy fishing town but has grown into a premier tourist destination as the years have gone by, and once you visit for the first time, you'll see just why this little spot of Mexican coastline has become so popular. The beach runs for miles and miles, offering lots of space for a myriad of fun activities including sunbathing, snorkeling, swimming, and fishing. It's a good beach for wildlife lovers as well, with lots of marine life found off the shore and sea turtles even coming up onto the sands at certain times of year. Various professionals and instructors can be found nearby offering guided tours and lessons too, so there really are a lot of options at Mahahual Beach, but you won't find too many eateries in the area, so it's a smart idea to pack your own food and drinks. If you would prefer to eat some local delicacies, head down to the seaside town of Malecon and stop off at one of the various seafood restaurants. Xcalak Beach is one of the true treasures of the Costa Maya region. Many tourists don't actually know about the beaches in this area, but the locals love them, and one of the golden rules of making the most of any vacation is to pay attention to the locals and follow them to find the best areas and most exciting things to do. At Costa Maya, locals rush to Xcalak Beach whenever they get some free time because the sands here are softer than anywhere else and the waters are astonishingly clear and warm. Diving and snorkeling are a lot of fun on these Costa Maya beaches, and if you're interested in reeling in a few fish rather than admiring them, fly fishing can be very rewarding at Xcalak Beach as well. Be sure to pack some protective footwear, however, as there are some rocky spots along the shore. Not quite located in Costa Maya but only a short journey away, the Sian Ka'an Biosphere Reserve is a UNESCO World Heritage Site and has been a hugely important part of Mexico's Quintana Roo state for wildlife science and conservation. Stretching out across land and sea and a large coral reef, Sian Ka'an covers a huge area, including vast swathes of vegetation and some truly breathtaking beaches. The beaches run from Tulum to Punta Allen and, given the important and protected status of the surrounding area, these beaches are almost entirely untouched by man, offering a raw and authentic look at Mexico’s Caribbean coast as Mother Nature intended. The area is so laid-back and old-fashioned that the on-site security guards will even often to bring some fresh coconuts down to the beach for a small fee. The beaches along Sian Ka'an can vary in size and style, with both soft sands and rugged rounds found along this part of the coastline, so there's a lot to see and explore, with activities like swimming and snorkeling recommended in the calmer area.